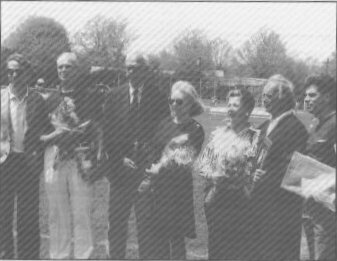 The club was founded by Peter Gall, Ward Doerschuck, and Bill Newlin-Wagner in the spring of 1973, after an unsuccessful request for support was made to the Garden City School Board. The self-supporting club was incorporated as a "not for profit" organization to promote and enable students to play hockey and compete in the Nassau High School Hockey League, which was founded two years earlier. The Wings first season was quite successful, as the team finished in 6th place in the twelve team league. The other participating teams were: Long Beach H.S., Hicksville H.S., St. Mary's H.S., W.T. Clarke H.S., Holy Trinity H.S., St. Dominic's H.S., Oceanside H.S., Seaford H.S., Levittown H.S., Carey H.S. and J.F.K. Bellmore H.S..
On December 27,1976 the Wings held it's first Alumni game at the old Racquet and Rink Arena and it became an annual event. The game pitted the returning alumni against the current varsity team. 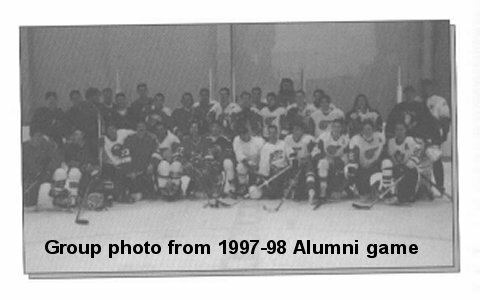 The Alumni won that first game 7 to 1. League rules no longer allow the current varsity team to participate in the Alumni game. An Alumni vs. Alumni game will be reinstated when we have enough interested Alumni players. 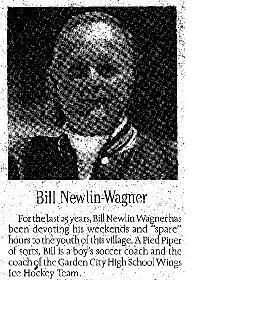 Alumni are encourage to contact us if they are interested..
At the TMA 1992 Sports Fair, Wings organizers Ward Doerschuck, Peter Gall and Bill Newlin-Wagner were honored with their families for their long, dedicated service. Click on the links below for team historical information.